Cyborgs On Crack is a Croatian “one-man-band” started in 2010 by Domagoj Krsic. Originally started as a self proclaimed “industrial” band with a goal to try and create music that barely resembled music, COC has evolved into a band that combines high energy dance music with catchy synth pop melodies, mutated sound textures, bizarre samples, and has been compared to bands such as New Order and Severed Heads. Cyborgs On Crack also produces psychedelic computer animations that add visual elements to the recordings. 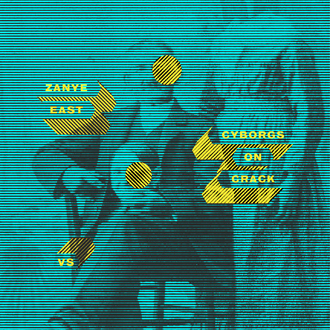 Zanye East is one among the plethora of monickers and stage names used by Zane Michael O'Brien, A&R, and head of ESCC9 Escape Sirius Cybernetics Corporation. Zane has recorded twenty six full length LPs under aliases Fauxmusica, Sacred Star (Collaboration with Gus Maiden and Lauren James), CyberChrist&Crucifixion (Collaboration with David Atlas), a three piece band, Folding Pyramid (backed by Zevan Rosser and Leah Christopherson), as well as his DJ and remix craftmanship under his IXΘΥΣ pseudonym. He has lived in places such as Indonesia, Bangkok, Singapore, New York City, San Francisco, Atlanta, and moonlighting as an English teacher in Istanbul, Turkey. He has offered and been offered productions and remixes from various affiliated artists Enix Inri, A V G V S T, Central Asian Nervous Systems, Argon Cowboy, PrismViews, ▼RIL Y▲ and Cyborgs On Crack.